After a quick stop at my hotel to freshen up after spending 4 hours in the sweatbox known as Legion Field, I made my way over to Regions Field, home of the Southern League's Barons. My friend Meg is also visiting Alabama for her own road trip, so I met up with her and we passed through a rather desolate area of Birmingham to reach the ballpark. 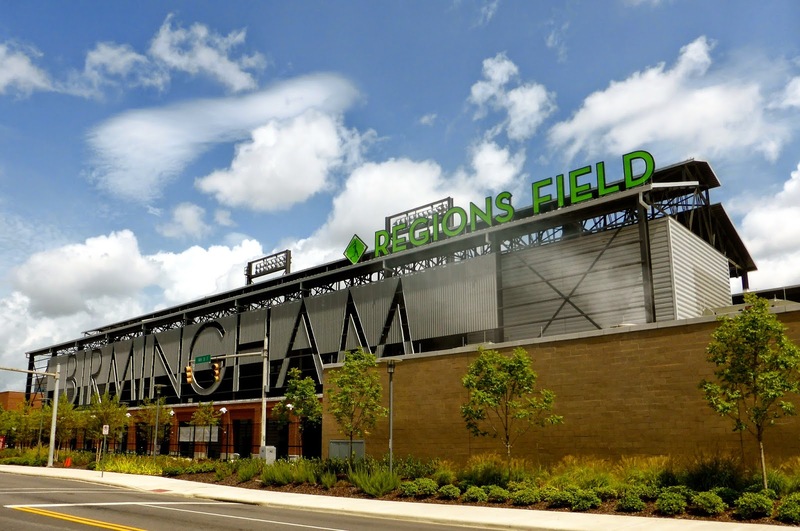 Opened in 2013 and named after a local financial services company, Regions Field is very impressive to look at from the outside, with the giant "Birmingham" sign reminding you of where you are. We stopped in at the Good People Brewing Company, just across 14th Street. It is the only bar in the area, and offers $5 microbrews which can also be purchased inside the stadium. They supposedly have no food, but I was given a hot dog and hamburger free of charge, which was quite appreciated as I did not eat at the football game. As we waited for the gates to open, a rainstorm passed through the city. It stopped briefly, allowing us to cross the street and enter the park, then started again, raining heavily for about 30 minutes, which delayed the game for just over an hour. 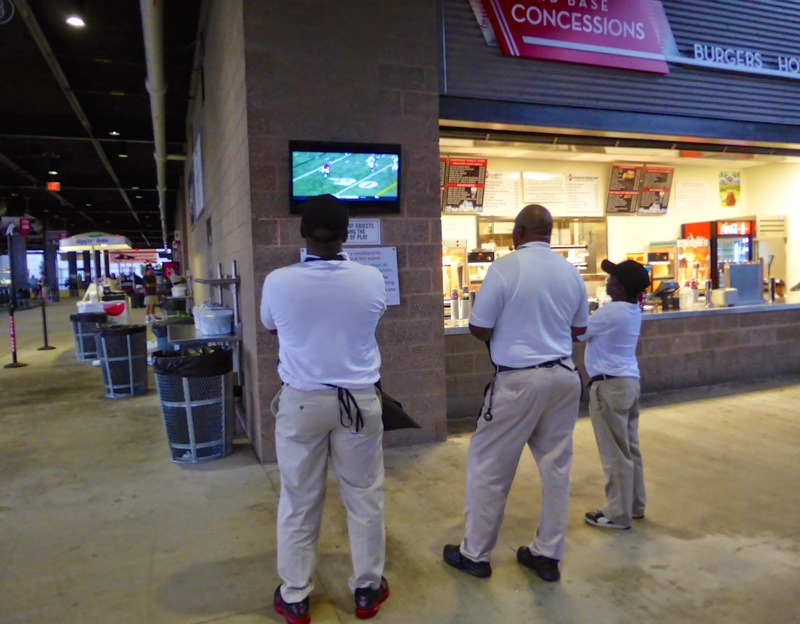 This was good news for the staff members, who were able to watch the end of the Alabama-WVU game on TV. Our first order of business was finding the concession stand with the Steel City Burger, voted as the 13th-best food item in all of the minor leagues. Very tasty indeed and well worth the $8. When the skies finally cleared for good, we took a quick walkaround before choosing our seats on the 3rd base side (below). As the game got underway, a group of about five well-dressed, twenty-something ladies arrived two rows in front of us, along with an industrial-sized roll of toilet paper. They began to wipe off the entire row of seats, blocking our view in the process. This didn't bother me much, but Meg was not impressed. The ladies were soon joined by a few guys, and they spent the next three innings chatting and moving about before finally leaving for an evening out. Seemed like the ballgame was just a place to meet up before moving onto the clubs. They left the huge roll toilet paper on the ground, which certainly perplexed the gentleman cleaning up after the game. There isn't much else to write about here. My only complaint is that the P.A. announcer and M.C. are too loud, as is the music between innings. Perhaps the speakers are set for when there is a larger crowd. 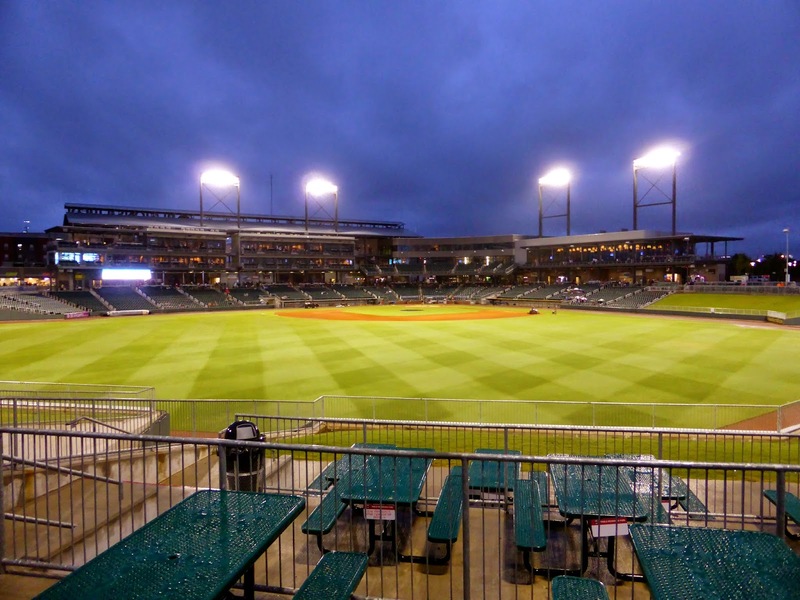 Regions Field is nice enough, with two huge levels of suites along first base for the hoi polloi of Birmingham, but with the weather and college football keeping fans away, I don't think I saw a game indicative of the true experience. If you go sometime, let me know how it is. Both teams were well out of the second-half pennant race, so there weren't any underlying stories here, just a bunch of players finishing the season. Ben Lively (4th, 2013) started for the Blue Wahoos against Francellis Montas, making his AA debut. 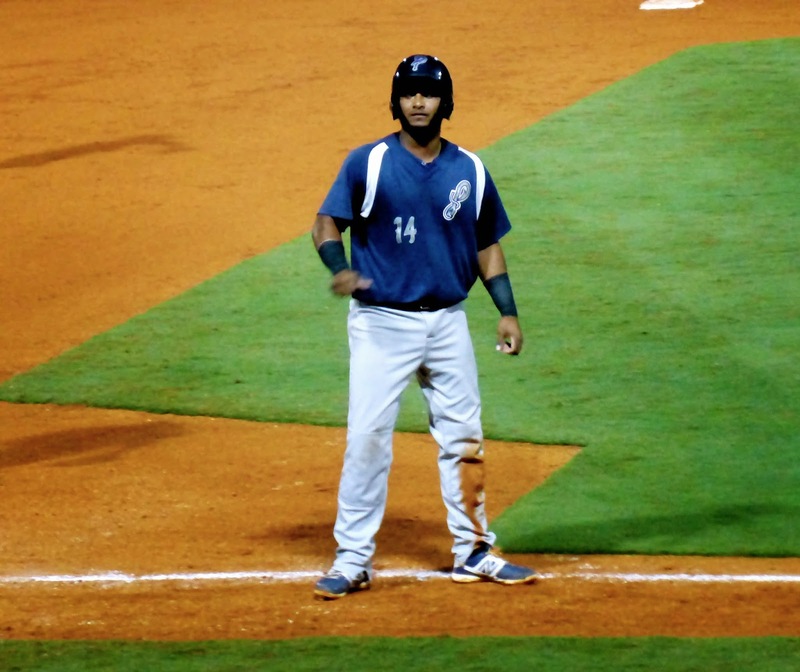 Pensacola scored in the first when Yorman Rodriguez reached on an error, stole second, stole third, and raced home on a throwing error by catcher Kevan Smith (7th round, 2011). 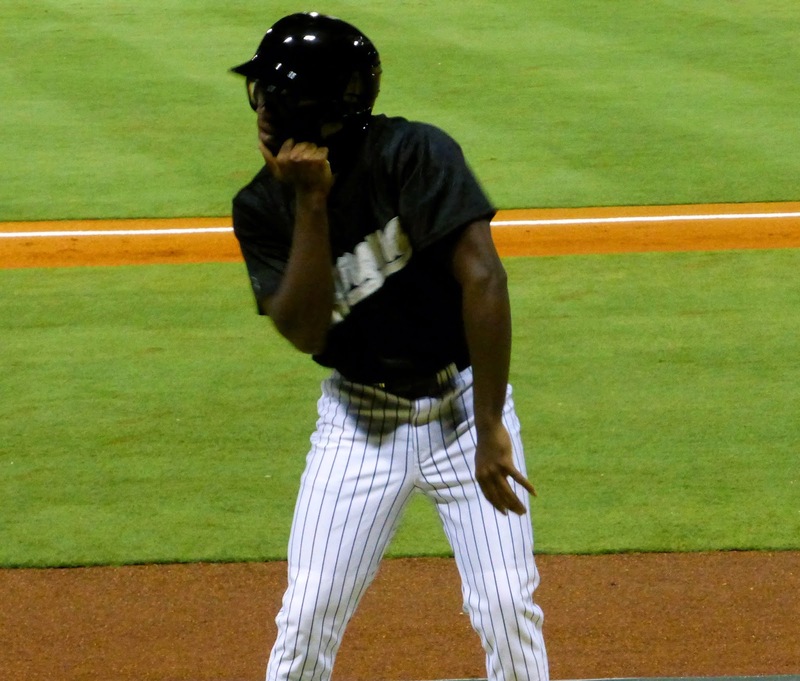 The Barons got that back in the third with a solo shot from Dan Black (14th, 2009, below) and Smith atoned for his error with an opposite-field homer to lead off the fourth. 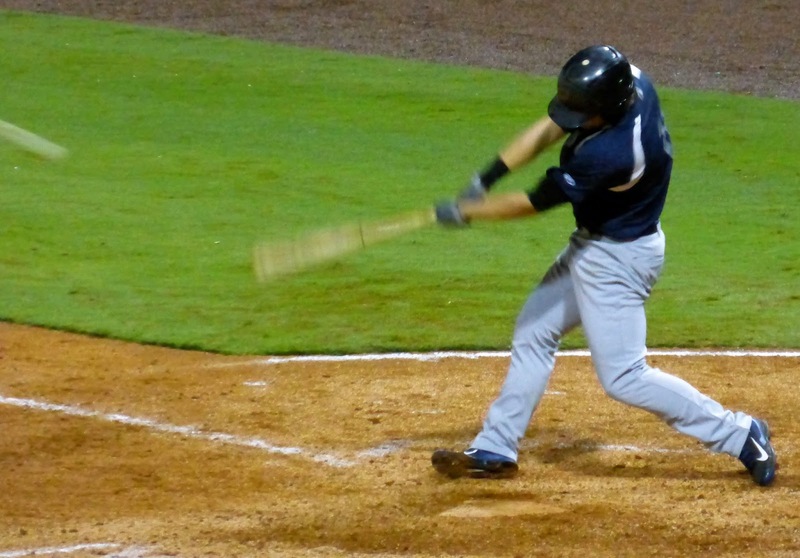 Birmingham plated another in the inning to take a 3-1 lead, which Pensacola halved when Rodriguez walked in the sixth and scored on a single by Travis Mattair (2nd, 2007, by Philadelphia). In the 7th, Juan Silverio led off with a triple and scored on a single by Ryan Wright (5th, 2011) to tie the game. Kevin Vance (19th, 2011) was brought into to quell the uprising, which he did with two quick strikeouts. It looked like extras were a possibility but in the bottom of the 8th, Smith led off with a walk and after advancing to second on a sacrifice, scored on a single by Joey DeMichele (3rd, 2012). 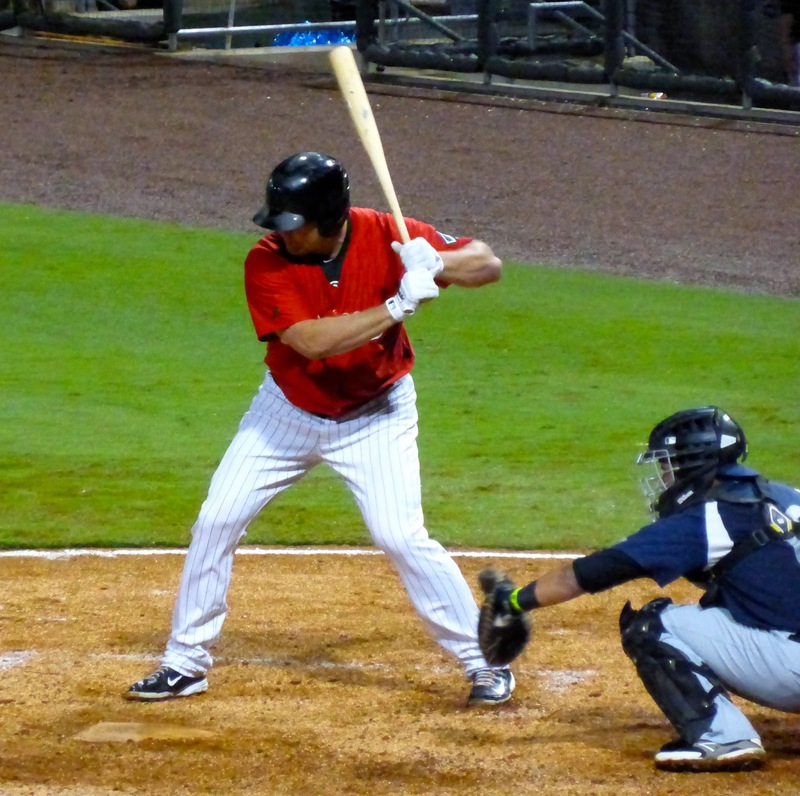 Birmingham added two more on a double by Trayce Thompson (2nd, 2009). Vance gave up a single and walk to start the top of the 9th but settled down to strike out the next 3 batters to get the win as the Barons prevailed 6-3. Vance struck out 7 of the 10 hitters he faced, including Kyle Waldrop (12th, 2010, flying out above) so he receives the Player to Watch award for this game. Breaking Bat Boy McCoy was in town! Another of the touring acts that make minor league ball that much more interesting, he dances on the dugout during inning breaks and has fun with the mascot. Not quite the San Diego Chicken. Venue #500 is today! I'm off to Huntsville for two of the last minor league games to ever be played at Joe W. Davis Stadium. 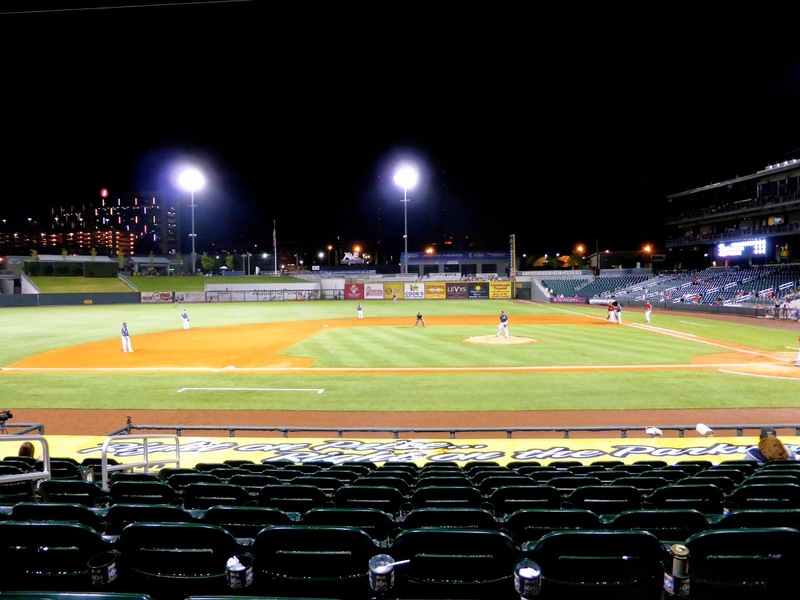 The Stars are bound for Biloxi in 2015, so the 500th visit will be bittersweet. The sweet part is that the game is now a doubleheader as Saturday's game was rained out. Check back tomorrow for a recap of the end of the 2014 Alabama trip.